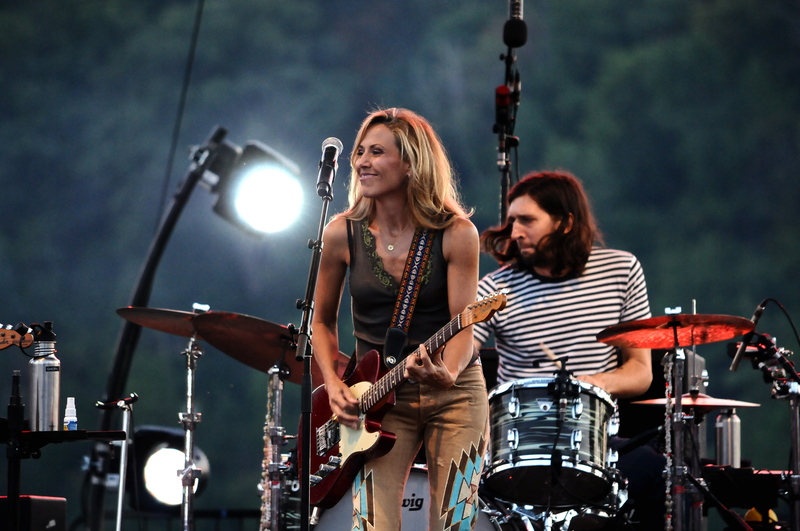 One of the most anticipated concerts on Artpark’s 2012 schedule was Sheryl Crow. Crow brought her fantastic band and played a set that more than satisfied the sold out crowd for this edition of Tuesday In The Park. While the weather was not looking good earlier in the afternoon, the sun came out and the rain stayed away for the evening. Having just turned 50 earlier this year, she performed with the vigor and swagger of someone much younger. Kicking off the affair with the lost gem “Steve McQueen”, she set the mood for the evening. Her backing band were no slouches led by former Cry Of Love and Black Crowes guitarist Audley Freed. His partner in crime Peter Stroud also on guitar. Glenn Patscha on keyboards and a solidly tight rhythm section consisting of drummer Fred Eltringham and bassist Robert Kearns. Crow has selected quite a talented band and it showed in their playing. Vocally Crow sounded as good as ever, perhaps the best sounding Artpark show this reviewer has ever heard. Case in point her highest charting hit “All I Wanna Do” from her debut Tuesday Night Music Club. The crowd starting getting rambunctious during her top 10 smash “If It Makes You Happy”. Crow played guitar on most of the tracks although she did put it down a few times to grab a mike and work the stage. One such moment occurred during the following song “Soak Up The Sun” that ended the main set. Back for the encore segment, Crow did the Linda Ronstadt cover of “You’re No Good. Closing out the show with “Everyday Is A Winding Road”, she delivered a show that will take a while for fans to get out of their system. Talented singer, songwriter and piano player Jon McLaughlin opened the show with a very captivating set. McLaughlin appeared with just a piano and slapped on a harmonica for a song or two as he played some original material along with the Billy Joel classic “Piano Man”. Catch this savvy musician when you get the chance, you won’t be disappointed. Special Thanks to Maria Costello for all her assistance in helping us review this show!